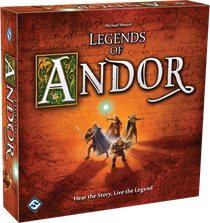 It’s rare that a game is both challenging in style and also in its ability to be reviewed, but Fantasy Flight Games and Michael Menzel have thrown down that gauntlet with the recent release of Legends of Andor. This review, both written and in video form, is going to be unique, as I really can only tell you so much. Why? Because the crux of the game are the Legends, and they are best known, by living them! Legends of Andor is an interesting game. It looks familiar enough, with great fantasy artwork, warriors, dwarves, and all the typical things, including a fire breathing dragon! However, when you start to peek under the treasure chests, you find the real beauty of it... this is not a role playing, hack and slash type adventure... no dear readers, this is a puzzle game, and one that both challenges you, flips your viewpoints on your head, and takes you an a most adventurous journey doing so! I wish, as mentioned in the video, that I could tell you everything that brought me to my rating for Legends of Andor, but I just can't. It would spoil so much for all you brave adventurers and I'm just not that kind of guy. Legends of Andor is really a book within a game. There are 5 Legends that are all progressive, in that you start the game with 4 pages of simple rules, but learn the more in depth movement, combat, and token systems by progressing through multiple objectives. The first thing to note, is that there is a LOT to Legends of Andor. A LOT! There's a lot of pieces, a lot of challenges, a lot of decisions. This is a 2-4 player cooperative game but as with most co-op games, you can play this solo, just don't try it with one little hero, all on their own! A Legend can take anywhere from 45 minutes to 90 minutes, to sometimes 2 hours to complete, and the base game comes with 6 Legends. 5 Legends are a major overarching story and the last is blank for you to write your own! The decisions are where the gameplay gets dicey. Each Legend you play will present you with a different opening, a different scenario, and will evolve as you spend time completing objectives. There is both a time track to keep track of each hero's movements and actions as well as a Legend Track to keep track of how you progress in the story. Be careful though, as with each monster kill you'll be progressing that Legend Track, so there are some big decisions to make! Most scenarios see you defending your castle from hordes of monsters, which at times, can give you a real “Tower Defense” feel, however, while doing this, the Legends will give you objectives to complete, and of course, these aren't things like going to see the blacksmith who is on the way out of the castle so you can just kill the things coming in. No, these objectives will see you splitting up, aligning the right hero to the right task and truthfully testing your ability to solve the challenges laid out, but stay loyal to the King and protect your home! Of all the things I'd like to tell you about, probably of those I can, that is most important to most people, is the combat system. Combat is extremely simple. Each Hero has their own board which is used to track money, possessions, gear, strength and willpower. The Monsters have their own similar board, but it is built into the main gameplay board as shown above, and lets you dynamically change the stats and strength of which monster you are fighting by aligning wooden cubes and discs based on monster type. When you fight a monster, you will place a red cube on the monster's icon (some are blank with no icons across the top which you'll learn about in future Legends) and a red disc on the willpower value, which shows three rows and the matching icons for each monster type. Each hero's board (shown below) shows the same style of willpower tracking with three rows and dice the to left. You basically throw the amount of dice aligned to the row your willpower is currently in. So in the case of a Warrior in the middle row (say 7 willpower which you start the game with), they roll 3 dice. The player rolls their dice, keeping only the highest result, while the monster rolls theirs. in the above pictured monster board, the Gor has 4 willpower and rolls 2 red dice (the black dice are for more powerful monsters, again, which you'll learn about progressing in legends). Let's say the Warrior rolls a 5, 4, and 1 keeping the 5. He adds that to his current strength (heroes all start with 1) and has a combat value of 6. The next player then rolls for the monster, and in this case would roll 2 red dice. For example the Gor could roll a 3 and a 2, keeping the 3. You'll notice under the Gor's red cube is a 2, that's the Gor's strength, so with a result of 3, the Gor has 5 for a combat value. Since the Warrior has 6 and the Gor as 5, the Gor loses this fight and loses 1 willpower. Now, this all took one action for our hero to complete, so if he decides to, he has to spend another action to continue fighting the Gor, or leave combat, and the Gor would go back to full strength. So, it's best to have some strength built up, prior to fighting, but again, if you kill a monster, your Legend Track progresses, and you better be able to complete your other objectives! Aside from combat though, you'll be given different tasks to complete, and its best to take your time to figure out which hero is best suited, by location and by abilities, to complete them. This, in our case, resulted in a lot more deciding then acting. The choices present a multitude of options, and finding the best one can take some time, but actually "doing" the decided upon action, is pretty quick. This left me realizing that while the gameplay is fun, it's the "figuring it out" that presents the most fun with the "acting it out" only being a small part of the mechanics. Each Legend is unique and presents deeper and deeper rules. All are fun, and the journey into the unknown makes the progression and how the game lays itself out a complete blast to play through. Unfortunately, once you know how to beat a Legend, there's not much replay-ability in them, other than maybe challenging yourself by using less Heroes or tweaking some objective placements. In fact, the Legends don't scale very well depending on the number of Heroes used. There are some minor things, but in most cases, the same number of monsters are going to come at you whether you are a duo or a 4 hero party, so be mindful! Michael Menzel, the designer and artist, is well known for his art in other games, like Stone Age, Catan, and many others. His style is unique and the artwork here is superb. There are options to choose male or female versions of the characters, although a big opportunity was missed in my opinion as there is no mechanical difference to them, just names and pictures. In fact, the characters are rather generic, in that they all start with the same strength and willpower. In most of our games, the Wizard was the most powerful, but again, I don't want to give too much away. Menzel has done an interesting job of combining a story arc into a game, and in the end, provides an experience that made me feel like I was playing a "choose-your-own-adventure" book. It's a Hit of an game and one that is best experienced firsthand. There is a lot of opportunity as well, with the potential to add more Legends as well as a base system customizable enough for you yourself to write your own! Above all else, this is not your typical Fantasy Flight game and it's a welcomed change, providing a beautiful setting, a different way to learn and progress deeper into the rules of a game, and above all else, a different style which is enjoyable for a co-op game. 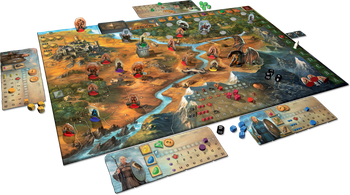 Cast your vote: Legends of Andor; Crit, Hit or Miss? Legends of Andor; Crit, Hit or Miss? This one was quite a surprise, took a while to get around to playing it but so worth it. Great integration of rich theme and challenging mechanisms. Really this subject is one of the new information for me. Thank you for sharing this kind of information’s. Your creation is good one. I got lots of knowledge from your post. Looking forward to get your next update information.Thank you.